2.5' in height, 15.75'' in width, and 12'' in depth. 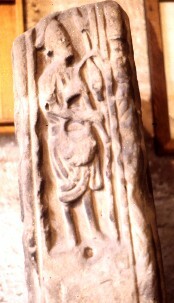 Cross shaft, dated to tenth or eleventh century. This side of the shaft has a figure collecting fruit from a tree. He is wearing a type of cap and has a satchel.